While Kierkegaard is perhaps known best as a religious thinker and philosopher, there is an unmistakable literary element in his writings. He often explains complex concepts and ideas by using literary figures and motifs that he could assume his readers would have some familiarity with. This dimension of his thought has served to make his writings far more popular than those of other philosophers and theologians, but at the same time it has made their interpretation more complex. Kierkegaard readers are generally aware of his interest in figures such as Faust or the Wandering Jew, but they rarely have a full appreciation of the vast extent of his use of characters from different literary periods and traditions. The present volume is dedicated to the treatment of the variety of literary figures and motifs used by Kierkegaard. 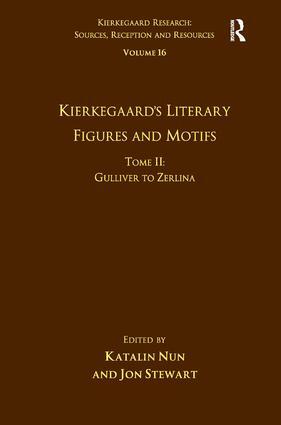 The volume is arranged alphabetically by name, with Tome II covering figures and motifs from Gulliver to Zerlina. Contents: Gulliver: Kierkegaard’s reading of Swift and Gulliver’s Travels, Frederico Pedreira; Hamlet: the impossibility of tragedy/the tragedy of impossibility, Leonardo F. Lisi; Holger the Dane: Kierkegaard’s mention of one heroic legend, Robert B. Puchniak; Jeppe of the Hill: the hedonistic Christian, Julie K. Allen; Niels Klim: project makers in a world upside down, Elisabete M. de Sousa; King Lear: silence and the leafage of language, Nicholas John Chambers; Loki: romanticism and Kierkegaard’s critique of the aesthetic, Matthew Brake; Lucinde: ‘To live poetically is to live infinitely,’ or Kierkegaard’s concept of irony as portrayed in his analysis of Friedrich Schlegel’s work, Fernando Manuel Ferreira da Silva; Lady Macbeth: the viscera of conscience, Malgorzata Grzegorzewska; Margarete: the feminine face of Faust, Antonella Fimiani; The master-thief: a one-man army against the established order, F. Nassim Bravo Jordan; Mephistopheles: demonic seducer, musician, philosopher, and humorist, Will Williams; Minerva: Kierkegaard’s use of a Greek motif, Anne Louise Nielsen; Münchhausen: charlatan or sublime artist, Anders Rendtorff Klitgaard; Nemesis: from the ancient goddess to a modern concept, Laura Liva; Nero: insatiable sensualist, Sean Anthony Turchin; Papageno: an aesthetic awakening of the ethics of desire, Karen Hiles and Marcia Morgan; Per Degn: towards Kierkegaard’s genealogy of the morals of the servitors of the state church, Gabriel Guedes Rossatti; Prometheus: thief, creator and icon of pain, Markus Pohlmeyer; Richard III: the prototype of the demonic, Nataliya Vorobyova Jørgensen; Robert le Diable: a modern tragic figure, Telmo Rodrigues; Typhon: the monster in Kierkegaard’s mirror, David D. Possen; The wandering Jew: Kierkegaard and the figuration of death in life, Joseph Ballan; Xerxes: Kierkegaard’s king of jest, Ana Pinto Leite; Zerlina: a study on how to overcome anxiety, Sara Ellen Eckerson; Indexes. Katalin Nun and Jon Stewart are both based in the Kierkegaard Research Centre at the University of Copenhagen, Denmark. The Kierkegaard Research Series is a multi volume series dedicated to a systematic coverage of all aspects of Kierkegaard Studies. Interdisciplinary in nature, the series combines articles on philosophy, theology, literature, psychology and history written by the leading international Kierkegaard scholars arranged into thematically organised volumes. Each volume contains a detailed introduction, written by the editors, which traces the history of the given theme in Kierkegaard studies and an extensive index making it easy to find where the specific themes, works and persons are treated. Under the editorial supervision and organisation of the Søren Kierkegaard Research Centre at The University of Copenhagen, this series serves as both a reference work for Kierkegaard students and as a forum for new research. The series is divided into three main parts; 'Kierkegaard’s Sources' includes articles which perform source-work research in order to discover and document the numerous sources of Kierkegaard’s thought; 'Kierkegaard's Reception' includes articles treating the countless aspects of the reception of Kierkegaard’s thought and writings in the different research traditions and the third section is for reference works including an extensive bibliography of works on Kierkegaard and a volume containing a list of the books Kierkegaard owned as they appear in the auction catalogue of his library. The Kierkegaard Research series is the most important, significant and comprehensive publishing treatment in English of the work and impact of Soren Kierkegaard.